Joel Greene here from Condo Hotel Center. Today I am thinking back to my last trip to the City of Angels. My wife and I flew to San Francisco, drove down the coast and stayed in a quaint bed and breakfast in San Luis Obispo, and finally made our way down to visit a friend in Los Angeles. Our friend gave us a tour of Santa Monica, Rodeo Drive, the Hollywood Bowl—you know, all the touristy places. And, I remember how cool it seemed to drive past the Beverly Wilshire (where the movie Pretty Woman was filmed). Now, 13 years later, I am turning my sights back toward Wilshire Blvd., with our newest condominium offering, coincidentally making plans to go back and visit that same old friend again shortly, and traveling through life with the same pretty woman by my side (Love you, Jackie). Solair is a beautiful, 22-story, glass-wrapped tower in the heart of L.A.
Solair is a striking, contemporary, glass tower, 22 stories tall and located in the heart of Los Angeles. Developed at a cost of $160 million, it offers a mix of residential living and retail. 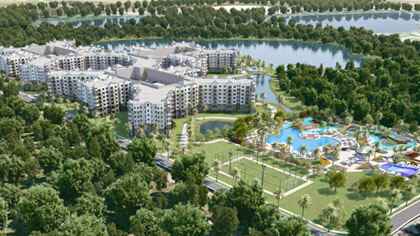 The residential portion consists of 186 upscale condos. The retail space is 40,000 square feet and includes shops and restaurants. 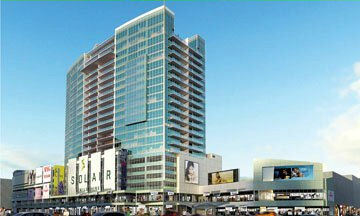 Solair is a $160 million development with both residential and retail components. The location is the historic intersection of Western Ave and Wilshire Blvd, right on the metro’s purple line. It’s just a quick train ride to downtown Los Angeles, or anywhere you want to go. Of course, the best perk of living at Solair is that you are a quick elevator ride away from all the restaurants and boutiques at street level. 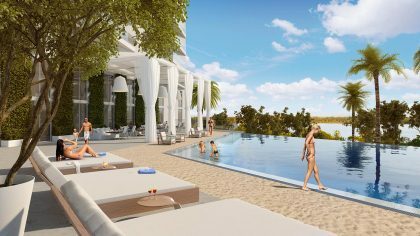 The 7th floor of Solair has an amenities deck with a pool, spa and 2,500 sq. ft. clubhouse. Located in the Heart of L.A. In addition to the restaurants within Solair, the property’s urban location offers approximately 100 restaurants within a five-minute walk of the property. 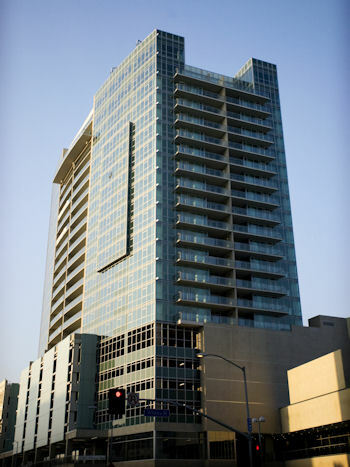 Solair also is within 30 minutes of Hollywood, downtown L.A., Universal Studios and the beach. Residents will also appreciate that when guests come to town, they are not far from Dodger Stadium, Disneyland or L.A. Live. L.A. Live, only 10 minutes from Solair, is a $2.5 billion, downtown Los Angeles entertainment complex, adjacent to the Staples Center, which is home to five L.A. teams including the NBA’s Lakers and Clippers, and the NHL’s Kings. If you’re a tourist, it is one of the new places that you must check out, and if you live nearby, it is one of L.A.’s “it” places to be and a perfect way to extend an evening out after a concert or a basketball game. 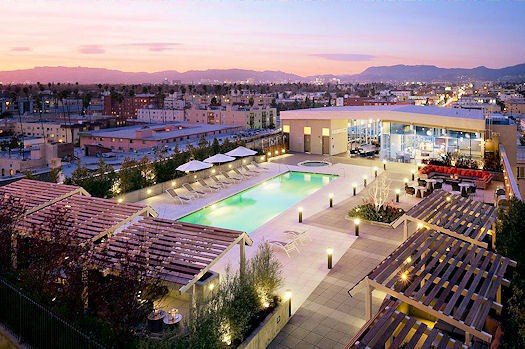 To create Solair, Koar Development Group, builders of many impressive mixed-use developments, like the Airport Center at LAX, combined efforts with Archeon Group, a Los Angeles-based architecture firm. Also involved was Super Potato (gotta love that name), an internationally acclaimed interior design group from Tokyo, Japan, that makes extensive use of wood, stone and water in their projects. 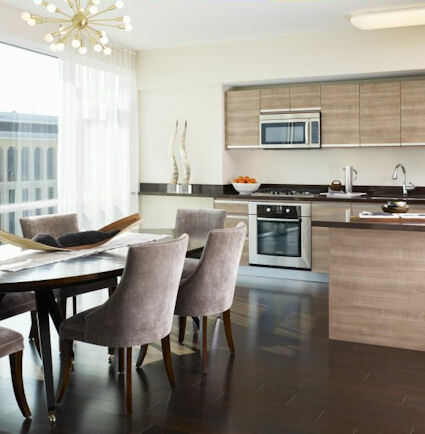 Solair kitchens feature Bosch stainless steel appliances, Italian cabinetry & hardwood floors. The condos have oversized terraces with exceptional views of Los Angeles. They feature Bang & Olufsen home theater and sound, automated blinds, hardwood flooring, fine finishes such as Bosch stainless steel appliances and Italian cabinetry by Bontempi. Extensive use of wood and stone is found in the bathrooms. 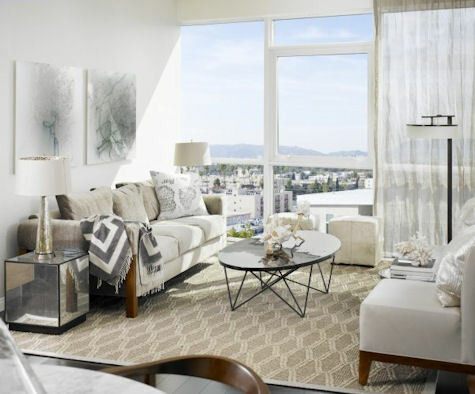 Solair offers 186 spacious residences with five unique floor plans of two- and three-bedroom condos, not counting the live/work units and the penthouses. The A1 floor plan, with floor to ceiling glass, offers spectacular views of Los Angeles. If you are interested in living in Solair, you may go to contract with a nominal 3% deposit, and if financing is required, take up to 45 days to close. Choose from a variety of spacious layouts for two- and three-bedroom residences. Financing is available through MetLife with 20% cash down for first and second home buyers, but cash buyers that can close quickly, will receive a 3% credit toward closing costs or HOA fees after closing. Want to know more? I’ve put together a comprehensive data sheet on Solair that has all the details. Just provide your name and contact information, per the developer’s requirements, and we’ll send it right out to you. Then, I’d welcome the opportunity to arrange for you to visit the property. Request the Solair data sheet here. As always thank you for your interest in the properties we showcase at Condo Hotel Center. If you know anyone who might like the residences at Solair, please feel free to pass along this Property Alert. And, if this property does not meet your specific needs, drop me a line to let me know what you are seeking. 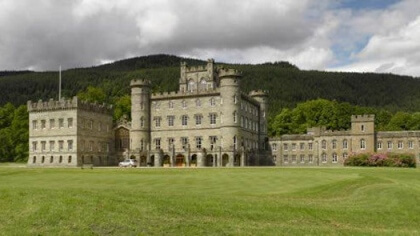 Or visit our Featured Properties page to see all we have available. 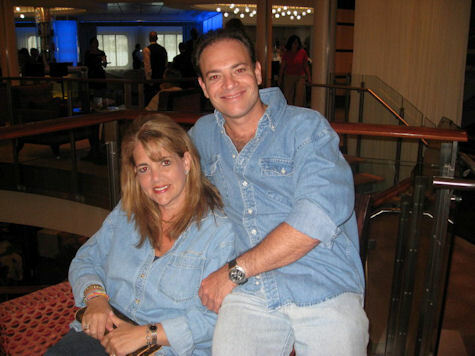 Oh, and since I mentioned her before, here is a picture of me and my pretty woman. She may not be Julia Roberts, but after 18 years together, she still puts a smile on my face every time she enters the room. Jackie and I out for a night on the town while the grandparents keep an eye on the twins.